Two miles northwest of downtown Milwaukee, 21st Street and West Garfield Avenue frame a small plot of publicly owned land. It’s called Alice’s Garden, named after Alice Meade-Taylor, the first African American director of the Milwaukee County Cooperative Extension. Here, crops push from the earth—corn and tomatoes, sunflowers and herbs—surrounded by wood chips, wheelbarrows, and tool sheds. At first glance, it might look like any other community garden. But this two-acre tract, hemmed in by chain-link fencing, is about more than urban agriculture. It connects two essential movements in Milwaukee’s African American neighborhoods: Black Lives Matter, and a garden movement focused on healing a community traumatized by the racism, abandonment, and day-to-day realities of living in the country’s most segregated metropolitan region. The garden is in the 53205 ZIP code and just south of 53206, in an area where male employment hovers around 50 percent and more than 40 percent of residents live in poverty. In 2014, when the Annie E. Casey Foundation, a child welfare organization, ranked Wisconsin the worst state in the country to raise an African American child, that designation was driven largely by Milwaukee. 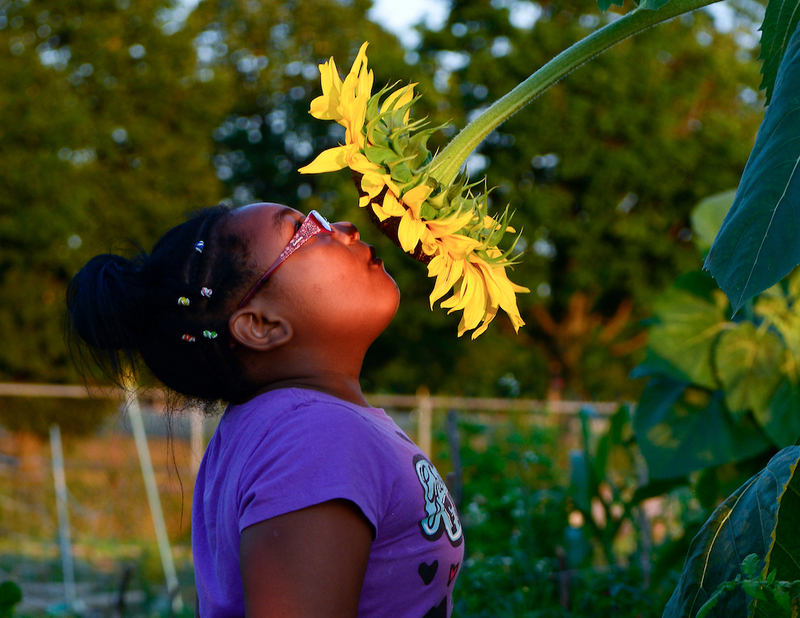 Alice’s Garden is not isolated from those struggles, but it provides some refuge from them—especially this summer, when the city experienced its most violent racial unrest in decades. Central to that sense of refuge is Venice Williams (pronounced “Venus,” as in the goddess of love and fertility), the garden’s modern-day steward and executive director. But the story of Alice’s Garden is not just about Venice Williams, as she’d be the first to tell you. It’s a long tale about the land and who lives on it, about justice and injustice, and about the changing nature of a city that has been tormented in recent decades by a loss of industry, and joblessness, and racism. It’s a cloudless Monday night in early August. Families gather at the garden, unfolding lawn chairs and spreading quilts as gardeners tend nearby plots: watering corn, picking peppers, weeding the peanut patch. Ning Thao, a Hmong gardener, is packaging green onions she’ll sell at a farmers’ market the next day. It’s the garden’s first Family Movie night—a screening of Disney’s Zootopia. The DJ plays a final song while children dance on the makeshift stage. And then, at sundown, Williams addresses the audience—a diverse crowd of people, many whom have never visited before. Five days later, her words will take on added importance. On Saturday August 13, Dominique Heaggan-Brown, a Milwaukee police officer, shoots Sylville Smith, a 23-year-old black man, after a traffic stop. The killing sets off the city’s worst racial unrest in half a century—angry crowds who will not be mollified, random gunfire, a squad car ransacked and burned, eight businesses torched. One of the businesses is MJM Liquor. According to witnesses, shortly after 2 a.m., six cars stop at the store. Three or four people get out of each car; they burglarize the store, then set it on fire. The incident happens just three blocks from Alice’s Garden. After urban farmer Will Allen won a MacArthur “genius” grant in 2008 for his work at Growing Power, Milwaukee became recognized for the strength of its agriculture movement, in which a new generation of green-thumb activists linked wholesome food to racial equality. For years, Alice’s Garden played a role in that mission. But after the 2012 killing of Trayvon Martin—the 17-year-old black teenager whose death galvanized the Black Lives Matter movement—the garden pivoted. After George Zimmerman, Martin’s killer, was found not guilty in 2013, Williams hosted a showing of the film Fruitvale Station, which tells the true story of Oscar Grant, a black man who was fatally shot by an Oakland transit cop. The post-screening discussion featured an unorthodox twist: only the African American men in attendance were allowed to speak. Meanwhile, gardening continues. There are 122 rental plots at Alice’s Garden, ranging from 8-by-16 feet for $15 a year, to 32-by-16 feet by $50 a year. The plots are rented by 90 different families or community groups, from youth groups to churches. Some gardeners are well past retirement age, some are teenagers. Some are gardening for the first time; others have been working land in one form or another for their entire lives. A 54-year-old lay Lutheran minister with a theology degree from Valparaiso University in Indiana, Williams says her mandate includes the spiritual. Williams has expanded the garden’s programs to include an array of initiatives–from potluck dinners to yoga in the garden, music concerts, back-to-school clothing swaps, labyrinth walks, herbal apprenticeships, summer job programs for teens, batch cooking classes, and working with Marquette University on production of rice varieties able to withstand Wisconsin winters, including varieties from Africa. Williams estimates that last year, about 5,200 people visited or took part in programs at the garden. To complement the work done there, several years ago she started the Body and Soul Healing Arts Center, which operates year-round at a former Lutheran church. The complexity of this piece of land, I don’t even try to explain it. Talk to her for more than a few minutes and it’s clear that land, history and ancestors are ever-present forces in Williams’s life. She’ll often tell a story, jumping back and forth through time to eventually make her point. Take for instance, the story of her daughter’s name, Sojourner. The modern-day story of Alice’s Garden began in 1832, when the defeat of Sauk leader Black Hawk signaled the end of armed Native resistance in what is now Wisconsin. In 1833, the Treaty of Chicago turned over Native lands to the U.S. federal government, allowing white settlers to move into the region. One key moment started early on the cold and grey morning of December 4, 1834. Samuel Brown and two companions took a narrow Native American trail north from what is now Chicago, reaching a trading post in what is now downtown Milwaukee four days later. Brown was one of the first white settlers in southern Wisconsin and became a leading figure in the growing Milwaukee settlement. Among his holdings was a farm on the city’s outskirts, on land that today is the home of Alice’s Garden. Brown made another mark on history. On July 4, 1842, Caroline Quarlls, a 16-year-old fugitive slave from Saint Louis, reached Milwaukee, having traveled by steamboat and stagecoach. But bounty hunters were on her trail and she knew she had to continue to Canada. To elude her captors, on her final day in Milwaukee she was hidden in a barrel. A deacon in the Presbyterian Church and a deeply religious man, Brown picked up the barrel and took Quarlls to his farm for safekeeping. The next evening he hid her in his wagon and they set out for a farm in Pewaukee, several hours away. Weeks later, guided from one abolitionist home to the next, Quarlls arrived in Sandwich, Ontario. Hers was the first documented case of a runaway slave reaching freedom via Wisconsin’s Underground Railroad. Over time, the land changed. Cities swelled across the country, and Milwaukee grew up, too. Brown’s farm was swallowed by development. German immigrants dominated the neighborhood for many decades, but that changed with the Great Migration of southern black people to the industrial north. Though Milwaukee’s Great Migration was several decades behind Chicago’s and Detroit’s, it no less shaped the city. In 1930, black residents were less than 2 percent of the city’s population. Today, they make up about 40 percent of the city’s roughly 600,000 people. Predatory housing and real estate practices have long restricted the African American population to certain neighborhoods, including where Brown’s farm had been. In the 1960s and 70s, African American communities bore the brunt of eminent domain policies and an “urban renewal” effort to bring a network of freeways to Milwaukee. In the 1960s, a north-south freeway tore in half the historic Bronzeville neighborhood. Then plans were developed for a downtown freeway heading northwest—right through what had been Brown’s farm. Homes were demolished, trees razed and an entire neighborhood destroyed—all for a freeway project that in 1972 was ultimately abandoned. The empty lots, however, remained. After the abandoned freeway project, Milwaukee County maintained ownership of the razed land. Alice’s Garden was inaugurated in 1972, but like much of the central city it was an afterthought, given minimal attention and funding. Then Venice Williams entered the picture. Williams came to Milwaukee on a summer internship in 1988, thinking she would ultimately move on to work in Africa. But, like her stories, her life is ever unfolding. “There is nothing about my life that has ever been linear and I hope there never will be,” she says. That first year all I did was deal with those mounds and apologize to the land for its condition. She became involved in the garden about 12 years ago through her husband Demetrius Brown, a Milwaukee native whose family came to the city during the Great Migration. Brown works with urban teens as part of 4-H Youth Development for Milwaukee County, affiliated with the University of Wisconsin-Extension, and had a project at the garden. Beyond Williams’s vision and drive, the garden’s transformation is due to two main factors: the support of Lutheran churches, and a public-private initiative to transform the 13-acre Milwaukee County Johnsons Park, of which Alice’s Garden is the northwest tip. “This place would not exist without Lutheran money,” Williams says of the garden, ticking off a list of Lutheran-funded projects, from the porta-potty to the yoga instructor. The development of Johnsons Park, meanwhile, was made possible through a $3.2 million project that began in 2009, spearheaded by the Wisconsin-based Center for Resilient Cities. Almost half a million dollars went into Alice’s Garden. Trees were planted, running water installed, and basic infrastructure built: picnic tables and shelters, tool sheds, and a cyclone fence. In the early evening of Thursday, August 18—four days after Milwaukee’s violent unrest and two days before another potentially tumultuous weekend—women of various ages and races gather at Alice’s Garden for a full moon ceremony and campout. The evening was billed to pay homage to fertile crops and “to honor the fullness within.” But the week’s events have forced a shift in tone and focus. “We need healing,” Williams says. The almost three-hour ceremony involves a range of spiritual and cleansing rituals, many of them based in Native American traditions and all with an emphasis on renewal and forgiveness. The formal activities end with a potluck dinner. Shortly before 10 p.m., the full moon makes its way above tree line, its rays forming soft shadows. The sounds of basketballs bouncing at a nearby playground mix with the chirps of crickets. People break into various small groups–some teens make chalk drawings, some women linger over the campfire, a few lay out sleeping bags while others, especially the older women, head home. I find myself sitting next to Linetta Davis, a 41-year-old African American woman who is dean of students at a Milwaukee middle school. Neither of us is sure if we will stay the night, but we’re not in a hurry. Perhaps it’s the residual effects of the ceremony, perhaps it’s the stillness of the moon. But Davis takes her time explaining how she became involved in the garden, showing little hesitation even though she and I are strangers. This is the only place in the city, honestly, where our differences aren’t that prominent. Davis goes back about a decade with Williams, first working with her on a program for African American young men, “Safe in My Brothers’ Arms.” She admits that gardening “is not my thing,” but her 8-year-old daughter, Zora, loves Alice’s Garden. Davis is also a member of The Table, a “first-century-style community in the twenty-first century” that is based at the garden and recently became part of the Lutheran Greater Milwaukee Synod. We continue talking, and a few minutes later we hear gunshots. Not particularly loud, and not particularly close. But clearly gunshots. I pretend to ignore them. Davis doesn’t. You can come here and forget about the chaos. Even if it’s just for one night. Williams, meanwhile, is looking not just to heal the present but to also build the future. What would she like to see at the garden in 5, 10, 20 years? “Oh my god,” she begins, then rattles off a wish-list: a year-round educational facility, food trucks, year-round jobs at the garden, more gardens on empty lots from the never-built freeway, the garden as a tool to revitalize the neighborhood, to build a less-segregated Milwaukee. Barbara Miner is a Milwaukee-based writer and photographer. Her writing has appeared in media ranging from the New York Times to the Milwaukee Journal Sentinel and The Progressive. Her story on the 53206 Zipcode in Milwaukee, “A Dream Deferred,” was named by the Milwaukee Press Club as the Best Long Feature Story in Wisconsin in 2015. Her most recent book is Lessons from the Heartland: A Turbulent Half-Century of Public Education in an Iconic American City (New York: New Press, 2013). Miner has a BA in journalism, a Masters in English Literature and an Associate Degree in photography. National Public Radio, wine seller? Yep.